Breeding, buying and selling comprise the economic engine that drives Thoroughbred racing. Private purchase from a breeder or owner. In all cases, you should enlist a professional to help you make your choices. Now is not the time to be leaning on the hunches of Uncle Harry, the family horse expert who has gone to the races every Wednesday and Saturday since the Flood and has followed every Thoroughbred sire and dam since before they were born. STEP NO. 1: Choose a trainer. No matter which way you choose to acquire your first horse, you will ultimately need a trainer; and a good trainer will be invaluable in helping you to select the right horse while avoiding common pitfalls. Remember that your trainer will be a close business partner, hopefully for many years to come. It is important to find one you are comfortable working with and who embraces similar philosophies about training your horse. In the case of auctions or private sales, take with you (or send on your behalf) a bloodstock agent at least, and ideally a trainer and a vet as well. In the case of claiming, you must have a trainer in place before you make your move. Claiming is the means by which the majority of new owners enter the racing world. It’s not only one of the least expensive ways to get into the game, but it’s the quickest: in as little as two weeks, a new owner can have the chance to see his own horse race – and perhaps win – at his home track. Claiming is the ingenious American method for insuring a sense of parity among horses in any given race. The price at which a horse can be claimed is established as part of the entry qualifications for that race. Knowing the horse can be purchased by any other owner or trainer generally discourages owners from putting horses in the race where their quality is sure to make them winners. If they do, it will likely mean that their valuable, promising horse will be claimed, and – before the day’s out – be the boast of someone else’s stable. The “claiming game,” popular as it is, is both complicated and fraught with interesting pitfalls – for new owners and experienced ones alike. There are many owners who have been enthusiastic “claimers” for years and have yet to turn a profit – but there is so much to be gained, so much steady “action,” and so much still to be learned that they remain as game for the challenge as they were when they began, whether that was two years ago or twenty. The claiming procedure is carefully regulated and involves a number of precise, prescribed steps. First, you will have spotted a horse you like or have a hunch about and who runs in claiming races within your price range. Before you act on your desire, however, you should find a trainer who either specializes in claiming, or at the very least is willing to work with you on the claiming process (please see the chapter entitled “Trainers”). It is not only practical to “go in” with a trainer at your side, but necessary: you cannot by CHRB rules receive your claimed horse without having a licensed trainer (or his/ her designated handler) to lead the horse away from the official Receiving Barn. The practical reason to engage a trainer prior to claiming is that trainers see virtually every horse on the grounds during morning gallops and workouts. If your intended claim is not a horse they know, they can generally seek out from the myriad of backstretch workers someone who knows something about the horse you fancy. The trainer will report back to you about what has been learned and knowledgeably turn you on to – or turn you away from – any given claiming candidate. As a first-time claimer, you can actually start and finish the process of becoming a licensed thoroughbred racehorse owner, complete with a stable name and an account, on the same morning of the day on which the course you wish to claim is racing (but do allow two or three hours). Your first stop on that day, unless you have phoned ahead and receive the forms by mail, is the office of the California Horse Racing Board (CHRB), usually located near the barn area. There you’ll be given 1.) an “Application for License” to own a thoroughbred racehorse, 2.) a “Supplement Application for License as Owner” which indicates in what form you intend to do business – i.e., Sole Proprietorship, Partnership, Syndicate, Stable – and what name(s) will officially be used, and 3.) a form called the “Personal Financial Statement”. (See sample forms and charts, figures 1-3). Your next stop is the Stewards’ Office, to obtain an “Open Claim Certificate” (see sample forms and charts, figure 4). This visit must be made by you in person. The Steward will need to be satisfied that you have engaged a licensed trainer to receive the horse, and that the trainer holds current Worker’s Compensation Insurance. The Steward will review your financial statement… and may also ask you questions designed to determine if you realize the actual cost of owning and keeping a horse (see chapter on “Operating Costs”). Once the Steward has signed your “Open Claim Certificate,” it must be presented to the CHRB office along with your completed application documents and a check for $250.00 to cover your application for “Open Claim License.” You will not possess a license unless or until you successfully exercise the claim, since one of the qualifications for license is the actual ownership of a racehorse. Your final stop is the office of the Paymaster of Purses presiding at the track where you intend to make your claim. You, or your trainer bearing a letter of authorization from you, must establish an account with funds sufficient to cover the cost of the horse you’re after. Its claiming price will be listed in the program on race day. Since you are not already an owner with an account, the Paymaster will prefer that you present a Cashier’s check sufficient to cover your claim. And don’t forget to add in sales tax, which varies from venue to venue (call the Paymaster’s office before having your check cut). Technically, you could pay by personal check, with a letter of guarantee from your bank, but there’s the risk that the check and letter won’t be accepted. A “wire transfer” from your bank is equally shaky, since the banks – in trading your money back and forth – may drop the ball and cost you the chance to execute your claim. Once the paymaster has established your account (it shouldn’t take more than 15 minutes), she will hand back a brown “Agreement to Claim” card (see sample forms and charts, figure 5). Though it is not usual, your trainer may advise dropping the “Agreement to Claim” card in the trash instead of in the box. The money in the Paymaster’s office can be re-claimed, or left on account for your next try. Once your time-stamped claim card has been deposited in the box, you still don’t know your chances of acquiring the horse in question. There is no way of finding out before the finish of the race how many others are also bidding for the claim. When the race is over, you will go to the corner of the Winner’s Circle where the official known as the Stewards’ Aide holds brown cards. If there is more than one card, they will be turned face down, and numbered on the back. Then, “the shake,” a bottle of “peas” or numbered dice, is shaken, and one pea is drawn. The cardholder coinciding with the number receives a “delivery slip” to present at the receiving barn – and now owns the horse. Again, you can reclaim your money from the Paymaster if you didn’t get the horse, or you can leave it on account. Finally, you will have to wait to actually take possession of your horse until it has gone to the Receiving Barn and been blood-tested for illegal drugs and excessive levels of legal drugs by the State Veterinarian. This may take an hour, or all afternoon. If either the Racing vet (who follows the horses from the saddling paddock through the race to the finish line), or the State Vet has spotted your horse as looking unsound, or injured, or bleeding from the nose, it will be placed on the “Vet’s List,” and you might not be permitted to enter it in a race in California for anywhere from a few days to 6 months (see page 42, Chapter on Stewards…Vet’s List). You – the new owner – will be responsible for the time and cost of getting the horse legally “up to speed” before you can race it. The ultimate “test” result in a claim will come in privately, the morning after the race, when your trainer tells you whether the horse woke up fit and healthy. If it didn’t, you may have been tricked into paying too much for too little. Actually, “bluffed” might be a more accurate term: as in poker, this is a fair part of the claiming game. Ninety percent of all racing horses will eventually turn up in a claiming race – and, as Mother said, you will have good days, and you will have bad ones. The most likely result will be a raceable horse. These are organized and scheduled according to the horses’ ages and their intended use. To determine where and exactly when the auctions of horses matching your dreams and your budget take place, check with your chosen bloodstock agent and/or look through publications such as Blood-Horse magazine. One caution here: if you notify two or three prominent auction companies of your general interest, rest assured that your mailbox will be crammed with auction catalogues running three to four hundred pages each, as well as announcements of individual sellers calling attention to their sale candidates. Buying at auction can be just as exciting as winning a race: you are dueling with the other bidders for the horse of your choice, and you can imagine the thrill when it’s your bid that the auctioneer’s gavel finally confirms. But this is not a simple or relaxed occasion. While anyone can attend an auction and anyone who can establish credit with the sales company is permitted to bid on and buy a horse, there are too many options to consider in too short a time to safely go in without an experienced trainer or bloodstock agent. Such agents are not only knowledgeable in the bloodlines and true value of horses, but can also handle the intricacies of the bidding floor, obtain the appropriate applications for credit and transfer of title, procure the official Bill of Sale, arrange for post-purchase veterinary examinations, and organize the transport of your horse to your choses barn. (For the cost of a flat 5% of the horse’s purchase price, the enlistment of a bloodstock agent is a good investment by any standard). Your agent or trainer, bearing in mind your budget and goals, will analyze the sale’s catalog for you, assess the stock being offered, and present you with a short list from a field of perhaps thousands of horses which conform to your goals and fall within your price range. You can usually go to the auction venue two or three days before the sale will take place and inspect the horses first-hand. You can ask that a horse be brought out of its stall and walked a bit, giving you and your trainer the chance to look it over for its general fitness, conformation and spirit. You can generally request of the seller permission to run any kind of non-injurious physical examination or test you need for peace of mind about the horse you’re about to buy – and at auctions, veterinarians are on hand to hire out on the spot for such exams. At all major thoroughbred sales, there are extenuating circumstances, which will allow you to return the horse given various discoveries. These “limited warranties” are stated in the front of each catalog, under Conditions of Sale. Generally, the warranties have a very strict time limit, which expires 24 hours after the sale, or upon removal form the grounds (whichever comes first). Clearly, it’s wise to have a vet examine the animal on the sale grounds immediately after purchase. An examination of the horse’s larynx and pharynx using a veterinary endoscope (a lighted, metal magnifying tube inserted via the nostril) may reveal problems with the horse’s breathing. Your veterinarian may detect a problem with the horse’s eyes. If you are buying breeding stock and you find a desirable mare in foal, you need to make certain that your “mare in foal” actually is pregnant. Be sure that your horse does not have the habit of “cribbing” – a stable vice which can lead to colic, a blockage of the digestive tract that can be fatal. If it is a yearling or weanling, find out if the auction company has guaranteed against it being afflicted with spinal ataxia (sometimes called “wobbler syndrome”), which is a spinal condition affecting coordination. Again, your bloodstock agent will check the catalog’s “Conditions of Sale” and interpret for you anything that is unclear or possibly disadvantageous. A cautionary note: literally anyone who wants to call him/ herself a bloodstock agent can do so. No license is required for agents to conduct business. However, any auction company issuing a catalog will be willing to offer names of trusted agents in the area, and they can usually be relied upon. Screening through an “advocate” organization such as the Thoroughbred Owners and Breeders Association, the TOC, or the California Thoroughbred Breeders Association, and requesting references are essential steps to take before enlisting your bloodstock agent. The main kinds of thoroughbred auctions are: Yearling sales, Two-Year-Olds-in-training sales, “Mixed” Sales (which include horses of all ages, including racing age), and the Breeding Stock sales. The yearling auctions are mainly held from July through October, with the principal arenas being – in order of magnitude, according to the number of top stallions standing at stud there – Kentucky, Florida, and California. Purchasing a yearling at auction can be one of the less expensive methods of acquiring a great racehorse… and it is also the riskiest. You will be buying purely on the basis of pedigree and conformation (i.e., “the ideal physical structure of a thoroughbred”). Because they are completely untried, any of these yearlings once it matures may turn out to have bad knees, weak tendons, or simply be a slow runner with no heart for competition. On the other hand, your “baby” may grow up to be the next best Secretariat or Landaluce. The “select” yearling auctions held in July at Lexington and in August at Saratoga involve only a few hundred handpicked colts and fillies, which go for an average price of $190,000 (Lexington is higher, Saratoga is lower). Most buyers are far better served at the “non-select” sales in late summer, where yearlings of every kind and in every price range are available. The September sale in Lexington is the largest auction of its kind in the world, offering up to 3,000 yearlings. Here is where the trainer or bloodstock agent with a good eye can find you a top-flight athlete, whether colt or filly, for less than $25,000. If you’re willing to plunk down a little more, you might wind up with another Thunder Gulch, who was purchased for $40,000. A final note: the buyer of a yearling must have both patience and optimism – in spades. Though all thoroughbreds are born to run, not all are guaranteed to become competitive athletes. 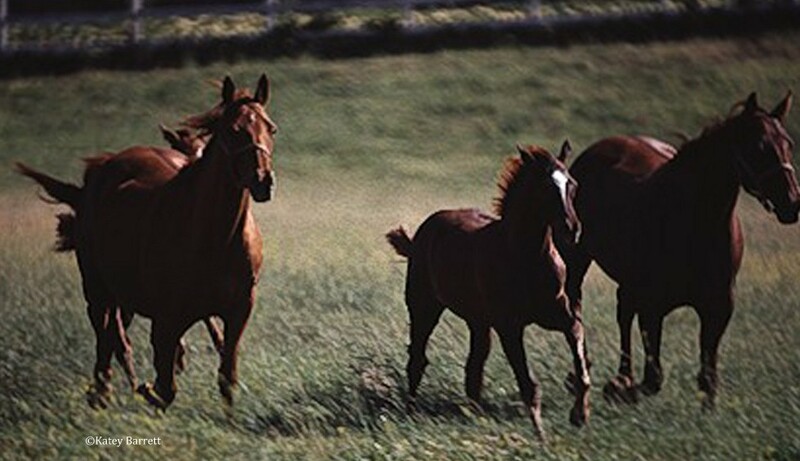 (Some trainers claim that yearlings do indicate if they have the will to run very early: they will be the aggressive ones in the “baby herd,” and they will rarely miss a meal). Since all horse birthdays are, technically, January 1st of the horse’s birth year, the “yearling” is anywhere from 6 to 23 months old. Therefore, the new owner and trainer may have up to a year of boarding, breaking, training, feeding, repairing “childhood injuries,” medicating and schooling the horse before it can actually demonstrate its fettle in its first race. But this horse will most times be like a child to you by then – and its first race day can definitely be a day worth waiting for. In case you don’t understand the age calculation, here is the calendar of thoroughbred breeding: the gestation period for horses is 11 months. Mating usually begins in the middle of February to insure that the foal is born after January 1st. mares are usually not bred after June because resulting foals would be too young on their first anniversary – a mere six months later. Like children, horses mature at different rates. They are ready for racing when they are ready. You can’t force it and expect wondrous results. Mating ends sometime in late June or early July. Thus, a “late” foal would be born in June, and therefore take more time to grow before being ready to race. Is it better to have an “early” (March or April) foal or a “late arrival” (May or June)? Opinions may vary. The one uncontestable fact is that a majority of Kentucky Derby winners are May foals. The Two-Year-Olds in Training auctions are generally held in beginning in February in a wide variety of locales (although they still tend to concentrate around the breeding hubs of Lexington, Kentucky; Ocala, Florida and at various California venues). The very logical rule of thumb at auctions in general is that the more a horse has been “proven,” the more you will pay for it (in the case of yearlings, a proven sire and/or dam with proven bloodlines is what you’re paying for). Horses for sale at the two-year-old auctions have already been broken and schooled. The top sales will offer only horses that have had a minimum of 90 days worth of “training” – i.e., breaking and galloping. At these auctions, the fillies and colts will often be “previewed” (either live or on video) – which means they are galloped, worked or breezed to clockers’ stopwatches. The standouts will be obvious, and everyone will be bidding for them. These fillies and colts are very close to being raceable – as little as a month from qualifying for races that specify two-year-olds. Note, however, that under a 1995 California statute, your two-year-old may not be put into its first race until it has passed its ACTUAL birth date. Since their soundness and fitness has, to some extent, been demonstrated, and since their owners have invested another year in keeping and breaking them, the two-year-olds-in-training are about twice as expensive as yearlings. In fact, you may discover that the two-year-old-in-training you’re about to buy was a yearling you looked at in one of last year’s auctions. Likely, he was bought by a specialist known in the racing world as a “pinhooker.” The pinhooker is an investor who, you might say, likes to gamble before the racetrack – that is, he or she spots a yearling, invests a year or more in breaking and training it, and if the filly or colt pans out, sells it for a great deal more then its yearling purchase price at one of the next year’s two-year-old-in-training auctions. Although you will be paying more for a two-year-old-in-training than for a yearling, you will still be paying less than for a two-year-old already racing. One of the great bonuses to buying a yearling or two-year-old-in-training is the chance to name the horse for life. Whether you name it for child, a grandchild, your spouse or a favorite place – or whether you choose to take off from sire and dam names and create some original turn of phrase that suits your fancy, this is one of the special enjoyments of being a horse owner. All prospective “new” names must be approved by The Jockey Club and title-checked via a publication known as “Names Currently Not Available.” This list is available via computer, and you can elect to do the title check yourself. The usual method is to invent four to six names. The only cautions are: avoid trade names or names of commercial products, avoid the names of famous or notorious persons, limit the name to 18 letters (including spaces and punctuation), and use reasonably good – or at least very subtle – taste. (The original thoroughbred breeders, i.e., Arabs, believes that a horse should never be named foolishly or in jest lest the horse live up to that name). Finally, you submit the names, in order of preference, to The Jockey Club via their “Name Claiming Form” (see sample forms and charts, figure 6). Eventually you will be granted use of the first name that comes up “clean”– that is, both permissible and unused by another racehorse. Note: In the racing world, a horse name can be changed with relative ease until it is entered in its first race. So even if the previous owner, breeder or farm already calls the horse you have bought by a name, the horse must still be officially named by you, through the above-mentioned Jockey Club procedure. No horse can race without an original, approved name, an identifying tattoo inside upper lip, and a Jockey Club registration, or “papers”. (see sample forms and charts, figure 7 to view a sample Jockey Club certificate of Foal Registration). While there are many international agreements about racing, names are left to individual countries. The result is that a name you choose might have been used anywhere in the world except the United States. When racing in America, therefore, all foreign-named horses bear bracketed country of origin beside their names. Mixed sales auctions can be held anywhere (usually from October through February), and tend to be catch-all sales, where horses are often being auctioned as the result of a legal dissolution of partnership, a stable surplus, the settlement of an estate, or because they are simply no longer desirable to their owners. The options can include fillies, mares, weanlings, colts, horses, geldings, ridglings, and even broodmares (sometimes in foal). In other words, the “mixed” sales provide the opportunity to buy (at a single event) one or two of almost anything you have in mind for your stable, and within almost any budget range. Most of the horses offered have at least some “form” on record, and are not likely to be the worst of surprises. Neither, by the same token, are they likely to be history-making diamonds in the rough. Here, above all other arenas, is where a thorough veterinary exam – complete with x-rays, blood tests, and endoscopy of the nose and throat – is an absolute essential. At the breeding stock auctions (usually held November through January) you can buy not only weanlings but also the most valuable thoroughbreds available at any auction, anywhere: top-quality broodmares. Buying in such a manner is one of the few affordable chances to get (in the form of her foals) an animal that, at exactly three years old, might be one of the 20 or so thoroughbreds – out of approximately 37,000 others turning three that year – great enough to race in the rich, high-profile stakes events. Though there is always the hope of acquiring a top national winner through claiming, any horse showing that kind of promise is rarely risked on the claiming ladder. The same tends to hold true of hugely talented two-year-olds: they simply don’t come onto the open market. If you, like most of us, lack a purse to spend a quarter of $1 million on a single, top bred yearling, then the road to your personal racing Nirvana may be to buy good mares and “grow your own” history-making champions. It’s a dream that has come true before. Private purchase is the ONLY avenue by which a sure-fire, stakes-quality horse can be bought, and they may go for prices you’d have to expect for the rarity of a horseracing “near-guarantee.” But there are other kinds of private purchases of a much more personal nature. You may live in an area where you have access to breeding farms, or owners’ farms, or training barns. If so, some combination of word-of-mouth, your own eyes and instincts, and a relationship with a local horseman may have led you to take an interest in the stock of a particular farm, or in a particular thoroughbred. You may also get a lead form your trainer or bloodstock agent who knows of a promising but little-known farm and possibly has entry there. Making an arrangement to privately purchase one of these horses has upsides and downsides. You and your trainer and vet can take all the time you want to consider and examine the horse and to research its lineage, without the pressure and emotional frenzy of an auction. On the other hand, you will be dealing with a set price from the owner. A wild, lucky buy is not likely. Remember that – as with the mixed auctions – there is a reason why the owner is willing to sell the horse you’re looking at. Part of what you must try to do as a prudent buyer is find out why. There are many reasons for selling a horse, ranging from a pure economics to personal taste, to veiled chicanery. There is no reason for the owner to reveal all his/her reasons, so it’s up to you to do the research: Is the owner really overwhelmed by current expenses? Is the owner really considering moving to a smaller property? Why isn’t the owner planning to race the horse? Remember, you’re buying the END of someone else’s dream – even if the animal is a yearling. That doesn’t mean it isn’t good. It simply means that you should be sure it fits your dream. In cases where the horse in question is already at a racetrack (as opposed to at an auction or a private farm), the stewards will require the Bill of Sale before the transaction can be approved (please see “Stewards” chapter for details).